Going to the Blue Mountains for couple of days to watch Geminid Meteor Shower sounded like a fantastic idea. Sit and relax at night on a cliff 1km above the sea level with a cup of tea and plenty of time before the sunrise – what could go wrong? 1. The weather. It was supposed to be a good day with few showers clearing at the evening and with increasing sunshine the next day. So, forecast was not ideal, but there seemed to be a good chance of skies clearing at night. 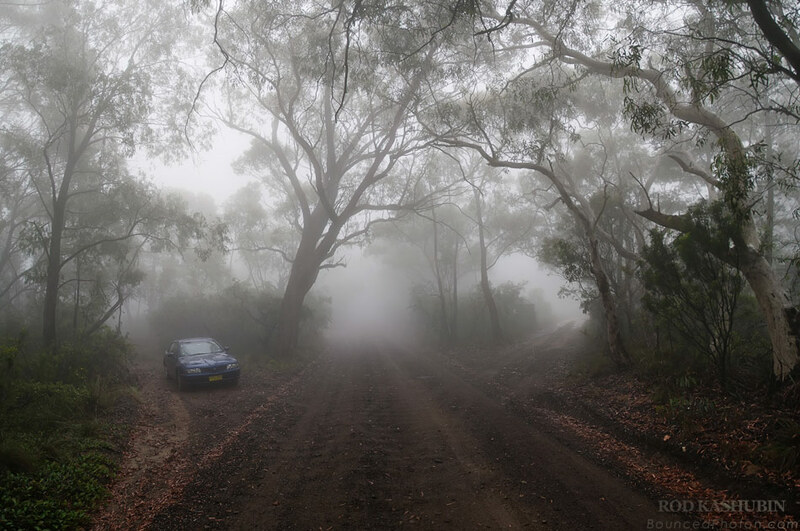 As soon as we got up to the Blue Mountains we drove into the fog-like clouds. They followed us all day long and became really thick at the evening. Did they know our plans? 2. The road. Anvil Rock lookout is just few km from Blackheath. It is facing north and has a great viewing area. It must`ve been a perfect place to see the Geminids appearing past the 11pm at north-east. The problem is that we never got there. All those few kilometers the road is like a washboard. You get a similar experience when driving along the railroad ties. I am sure there are people driving there on 4WDs following the 80km signs, but we really felt that we might lose a wheel or two before getting anywhere on our sedan. Having enough after 300m we decided to stop and walk to the nearest Pulpit Rock lookout. This is the picture with a view at particularly that moment. The photograph is a composite of 4 shots I took manually to have a broad perspective of the surroundings. The .NEF files were then processed for removal of optical distortions, noise, vignetting and stitched into a panorama. A bit of curves, vibrance, more noise removal, crop and here it is the mystical road to the Anvil Rock and Pulpit Rock lookouts. 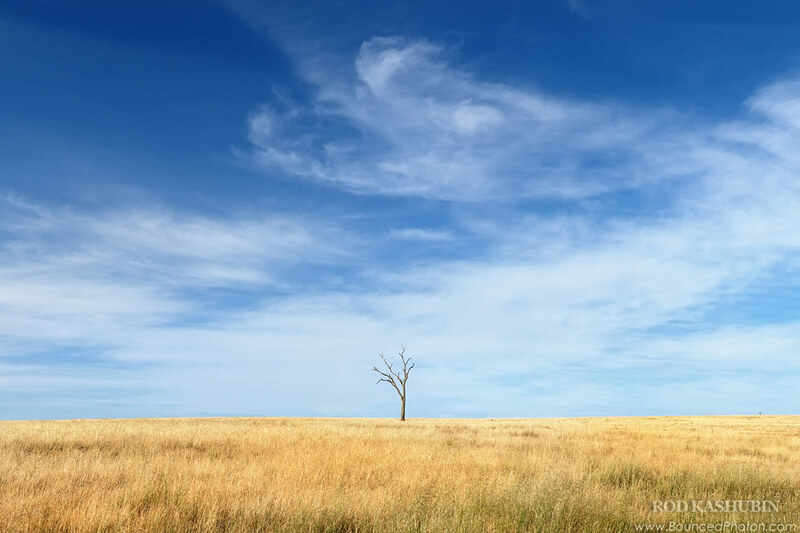 Avoiding a highway and going along the deserted road through the country NSW paid off with beautiful late afternoon views of numerous farming fields and grazing grounds. Playing old-time favorites including Along The Road To Gundagai, Jingle Bells, Memories Are Made Of This and many other at Canberra Floriade every year since 1992 is this magnificent and grand instrument. 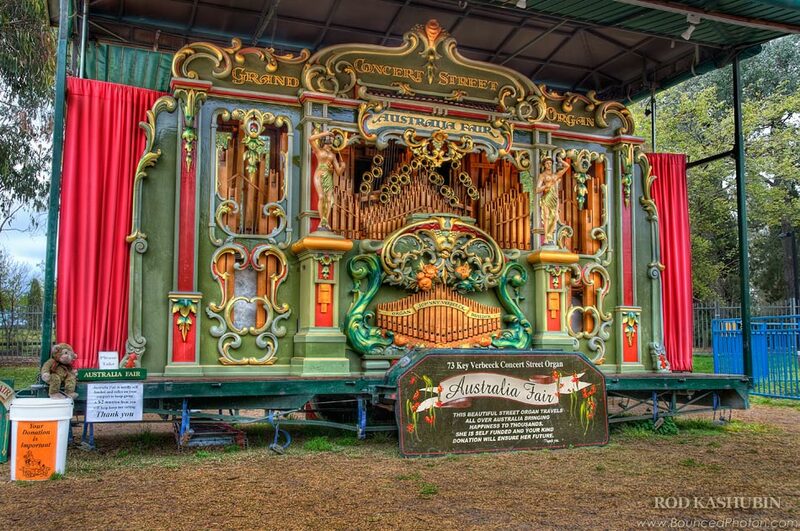 It is known as one of the largest and finest outdoor auto pipe organs that ever came to Australia. The 73 key Concert Street Organ was built in 1992 by following the original 19th century design by Johnny Verbeeck in Belgium, the organ manufacturer with the family history and traditions of organ making going back to 1884. Some of the organs back in those days were operated by organ grinder turning a big handle that activated the blower and card feed mechanism. The modern ones are commonly using a belt drive and a small motor with a battery. The instrument is played mechanically by passing the book music with perforated holes representing notes through the reader. That allows pipe valves to open whenever a hole passes by and to produce a sound. That is a fantastic instrument which I hope to see and hear again. In this HDR I combined the original background with tone-mapped front which in my opinion gave the picture a bit more realism and put the focus on the street organ. The 3 shots were taken from the tripod set on a low level. There were a lot of people nearby with children coming closer to touch the instrument and tourists like me taking hundreds of pictures. However, I was lucky enough to wait till the right moment and have few shots with no one in the frame. I have few more photographs of it from the back including one with the owner demonstrating a book music which I will hopefully process and upload sometime later. Walking along the beautiful bay shore with people enjoying Friday`s morning sun it sounds unbelievable, but about 100 years ago this place was the center of bubonic plague outbreak. Filled with rubbish and infested with rats I doubt it was a popular weekend spot. However, as time passed and Sydney changed, Walsh Bay became busy cargo terminal with tones of wool shipped around the world every year. Many of the port buildings are still there reminding about its past. Nowadays, Walsh Bay is a modern amusement complex with bars, restaurants, shops and a theatre located (or better to say hidden) in the very centre of Sydney. Ford truck on the picture was neatly parked at the back of a restaurant. By my rough guess, it is a Ford F-150 (or 250, 350?) pickup truck built in USA around 1985 (let me know if you know for sure). 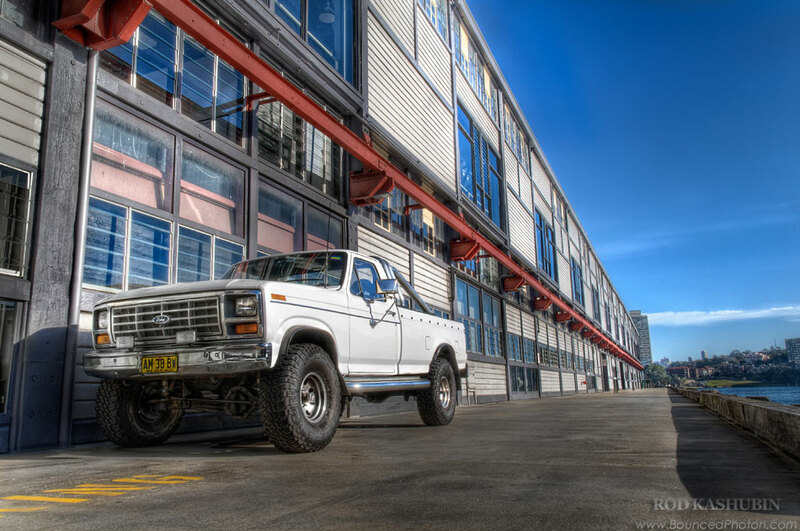 It is known as the best-selling truck in US for 30 years and is now a popular classic vehicle for restoration projects among the enthusiasts. The photo is no exception as most of the other ones I posted. It is a HDR image blended from 3 shots taken with different shutter speeds from a tripod. It was then tone-mapped into a nice and mostly grey tiff file. The major work after that was on adjusting the contrast, making the white white and other colors as bright as they should be. May be a little brighter for some, but I think it came out pretty naturally looking. Or am I just used to it now? Curtiss P-40 Kittyhawk on display with a smile after a day of aerobatics at Temora Aviation Museum. 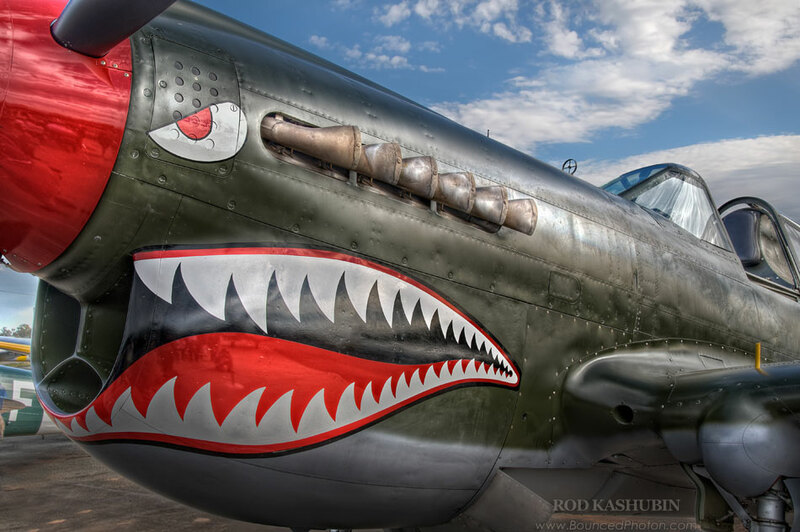 P-40 is all-metal fighter and ground attack aircraft designed in US and used in 28 nations during the World War II. It was the main fighter aircraft used by the Royal Australian and New Zealand Air Forces. This particular one was assembled in 1st Aircraft Depot at Hobsonville, New Zealand in June 1943 and assigned to 2nd Operational Training Unit. After the war it did escape the fate of being scrapped and was eventually bought by Allan Arthur. It took 8 years to fully restore the aircraft and I was lucky enough to see its amazing display that day at Temora. Only 19 of them remain airworthy out of 13,738 built. This is a tone-mapped HDR from 3 RAW files shot handheld with my Nikon D90. The tea store and tea room at The Glasshouse. Pleasant relaxed ambience, friendly service, hundreds of teas to select from – an awesome place to visit for a lunch or a Devonshire Tea. I counted 121 boxes with teas at the background shelf, but there is definitely more as it continues to the left. So far, I tried about half of them and I will be happy to go for a second round after I am done. 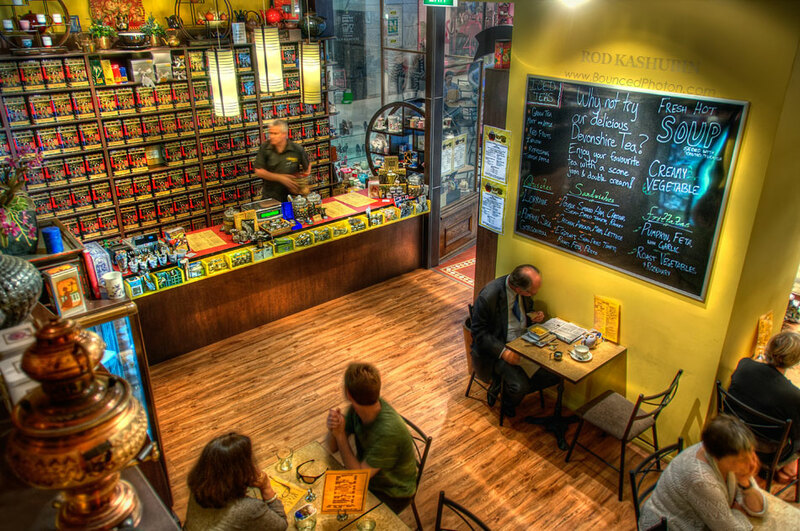 Established in 1993 in Paddington suburb of Sydney The Tea Centre now consists of 7 retail shops around Australia and supplies tea to more than 500 restaurants and cafes. Annual turnover is about 25 tones of tea and with 180 different varieties each of them is said to be of a great quality with no artificial flavors or preservatives. Image is created out of 3 bracketed exposures [-2,0,+2] shot hand-held and merged into a HDR. The HDR file was then tone-mapped into a 16-bit TIFF and post-processed mainly for contrast, color and light details enhancement. 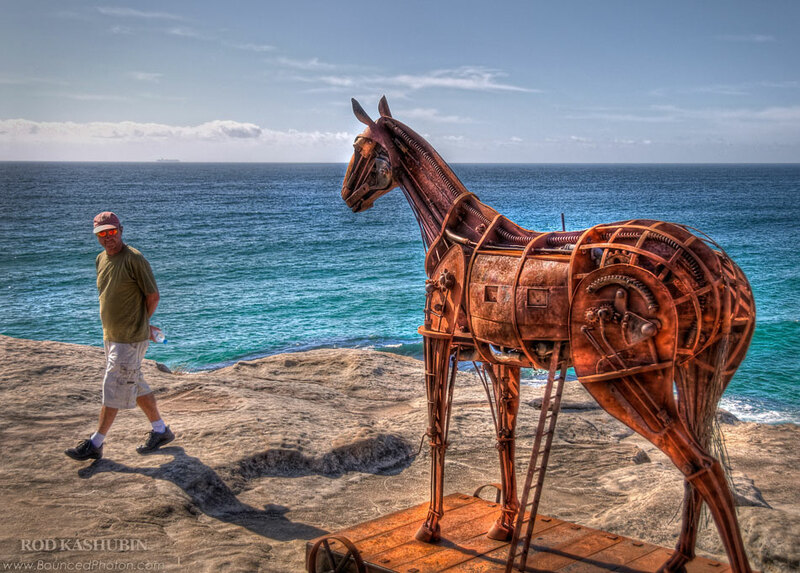 Yep, that’s right, it is indeed a mechanical horse on the edge of a cliff. Would be priceless to know what that guy thinks while he walks around it. I myself looking on the selection of metal details and how it’s all fitted together thought that it must have taken hellavalot of time to get it all into the form. Funnily enough I didn’t even question myself at first whether it is a horse or what. It must be because it is. Shape is made very well with all the horsy proportions and horse looks. However, what’s the name? Guess what, you have to buy a guide to know it. That is a unique idea of itself to set hundreds of artworks at the public display and did not put a single sign with a name. Just a number. But that’s alright, there is a positive side to that. It got me (and probably hundreds of others) wondering what name could have been chosen for it. Trojan Horse 2nd Edition? Or A Bit Rusted Since the Bronze Age? Your version? Sculpture by the Sea 2009 is annual open-air exhibition set along the Bondi to Tamarama coastal walk for thirteenth time. The impressions of more than 100 artists carved in rock, shaped in bronze and even stuck into the liquid foam are displayed from 29 October to 15 November 2009. This is a tonemapped HDR from a single RAW. 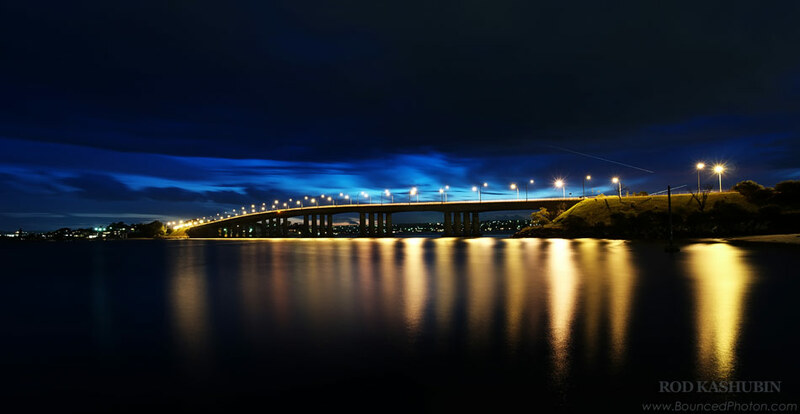 One of the 3 bridges offering a crossing over the Georges River to the South of Sydney. Commenced in 1962 and built in 1965 as a part of F6 Freeway project linking Sans Souci and Taren Point shores. The light traces above the bridge on the right are airplanes on their approach to the Sydney Airport. This is a stitched panorama from a couple of 1-minute exposures. Post-processing: curves, reducing yellow color cast, noise removal and minor dodging. While hurrying down a slope to the Botany Bay shore to capture quickly setting sun I turned back and saw a small rainbow touching the ground. At that day of changing weather small pack of rain clouds patrolled Sydney watering various locations. That is the kind of weather when sky is putting up a great display and a final act most of the times coincides with a sunset. 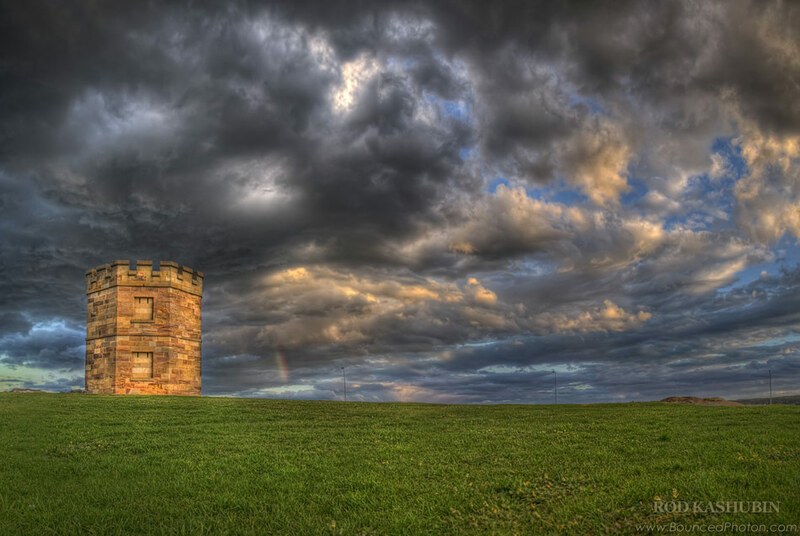 The Macquarie Watchtower was built at around 1810s as a military guardhouse and a lookout station with an intention to intercept smugglers. A preventive officer who lived there would watch all vessels coming along the coast from the tower`s flat roof. Ships that entered the bay were required to stay mid-stream until the clearance papers were checked by a customs functionary. I had about 3-5 minutes to photograph everything I wanted here. Sun was setting down quickly and I did not want to miss that. In a hurry I set my tripod at the lowest position possible. This helped to remove the background views of parking and distant bay creating better composition. Lying on the grass I then made a quick bracketing set varying exposures and focusing straight on the tower. For next attempt I decided to do a panorama in 4 parts: 2 below the horizon and 2 above. Focus is set and I am switching it over to manual to stop re-focusing between the shots. Vibration Reduction is off too and here we go, 3 clicks and [-2,0,+2 EV] is captured. Looks good on the preview and I am gone to the rocky shore. But when I looked on the pictures on my PC afterwards I was upset by a mistake – one of the panoramic sets has the tower in soft focus. Looks like something went wrong with my manual setup. However, I was lucky first shots came out alright and I was able to use the tower from there. The next part of workflow is as usual: create a HDR file from every AEB set (3 RAW – 1 HDR), stitch 4 resulting HDRs into one panoramic HDR, tonemap into a 16-bit tif and do some post-processing for contrast and colors. More than two centuries ago this place was named Sting Ray Harbour by Captain James Cook who just landed here in New Holland and caught few sting rays after a Sunday fishing trip. Renamed to Botany Bay later it is now a place of the major port in Australia, Port Botany. A number of berths for container ships and bulk liquid carriers allows for handling of around 10 million tons of various imports and exports in a year. 10 mil. tonnes that`s about 256 Sydney Harbour Bridges exported. If you are still wondering why did I say New Holland, that was the name of the continent at the time. Common for 180 years it was changed to Australia in 1824. For this picture I made a number of photographs from the tripod with different exposures and a hope that it might merge into a HDR. However, as there were many moving subjects (e.g. ship, water) it proved to be more rewarding to use the single RAW and tonemap it lightly. 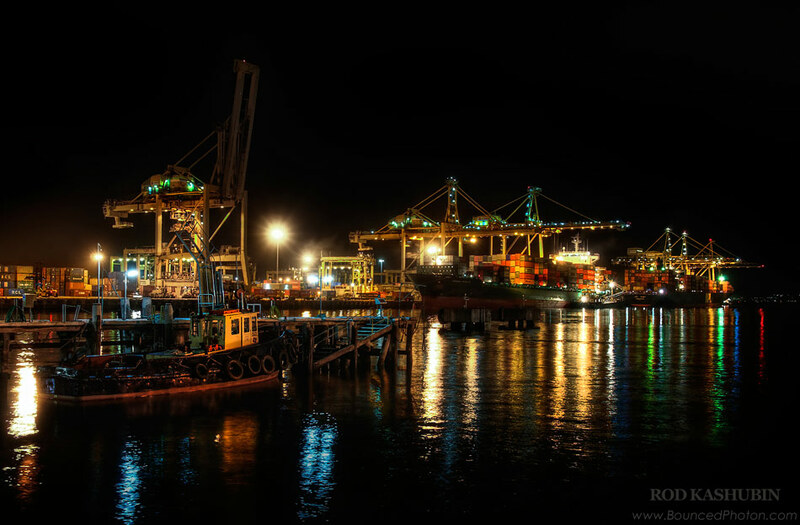 Numerous lights around the port created thick yellow tone on everything, so I have to reduce the color cast a bit and also enhance the contrast of some areas.